We are so excited about our new services offering this year—the New Business Starter Package. In response to customer demand for an affordable way to create a top-quality business logo and website, we’ve developed a new package that gets your new small business online and looking sharp, all within the budget of a startup business. While there are less expensive options online through $50 logo sites and free DIY website builder platforms, this package is the next level up. It offers custom, professional, and thoughtful branding and website services that have been reserved in the past for much larger companies and budgets. This package is designed for a small business that recognizes the value of custom marketing services backed by 20 years of experience in professional web design and search engine optimization (SEO). For many years, we had an entry level pricing structure close to $5,000. While an ideal fit for many businesses, it left our services out of reach for some folks. 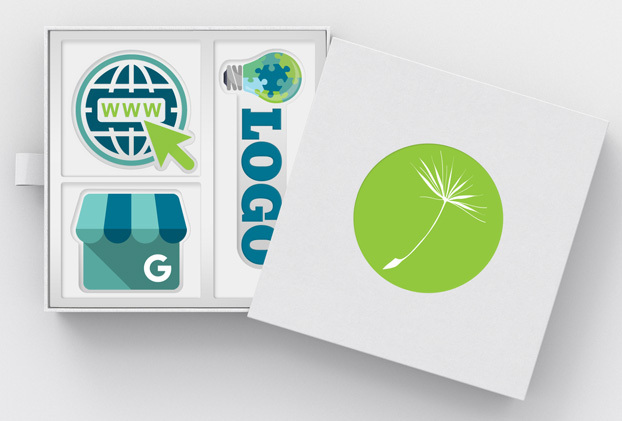 With this new starter package, we can offer new businesses a way to create and launch their message. A thoughtful and custom logo design that you can use far beyond your online marketing. It will serve as your brand and determine the direction and tone of all other design and marketing. A mobile-friendly one-page website with up to five sections, including on online submission form to encourage site visitors to reach out to you. Consulting on best practices for maximizing your presence online using Google My Business (a key tool in for any local business). For an example of what this starter package looks like in practice, please see the sample below. We created a logo, with variations for different uses and the website found here. As mentioned above, there will still be less expensive options out there. But, they will not be the same. Business owners that understand and appreciate that local and personal service, custom work and years of experience offer more than automated online tools will be the best fit for this new package. Our goal is to hit an important intersection between quality and affordability, previously unavailable in the market. That’s the easy part! Give us a call at 205-298-7655 or email Alli.